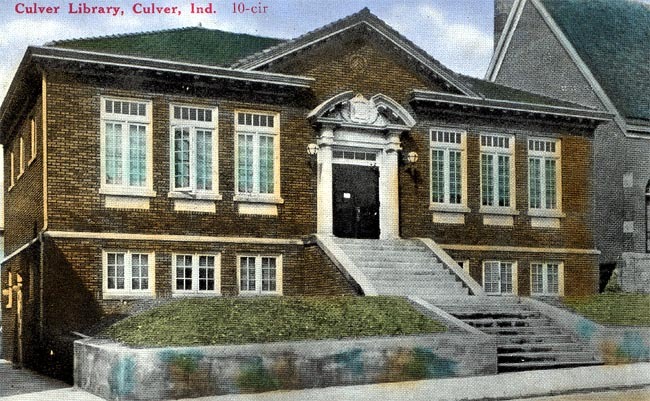 The Carnegie Library (built 1915) depicted in this undated, colorized postcard. 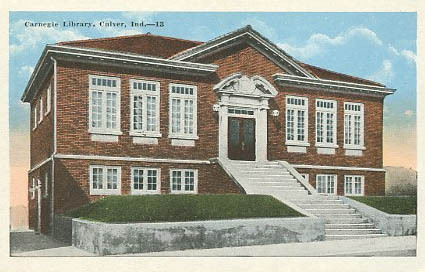 The Carnegie Library, Main St., early postcard (date unknown). 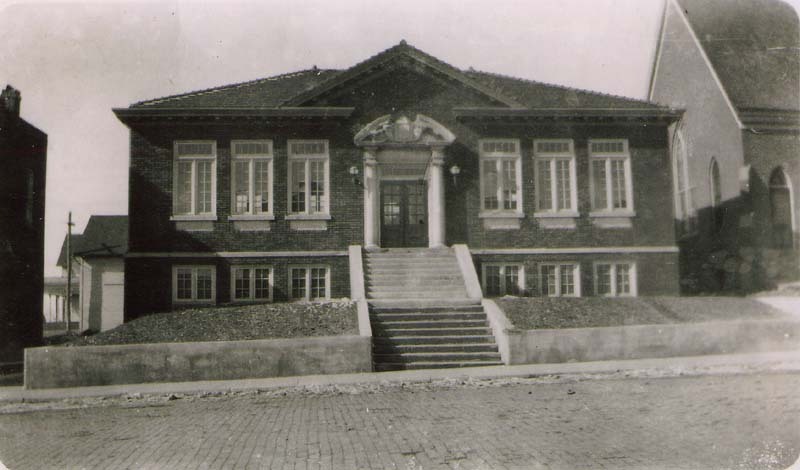 A very early shot of the original Carnegie Culver Public Library on Main Street shows the street while still a brick street, probably close to its construction in 1915. This photo was kindly loaned from Robert Waite. 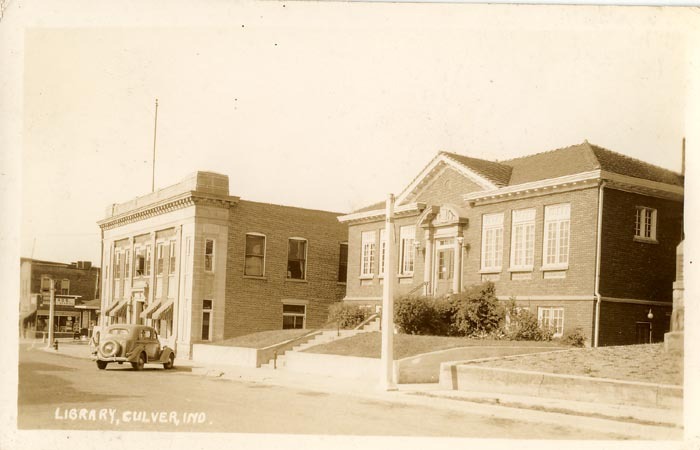 The Culver Public Library as it appeared in the 1930s; the old State Exchange Bank can be seen to the left. 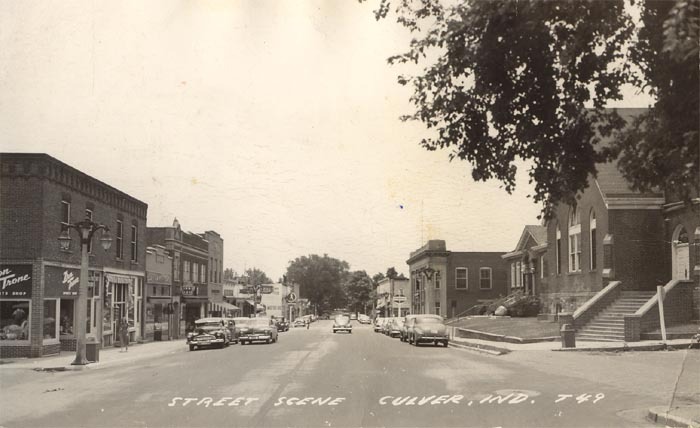 "Street Scene, Culver, Indiana," proclaims a 1950s postcard depicting Main Street looking south. 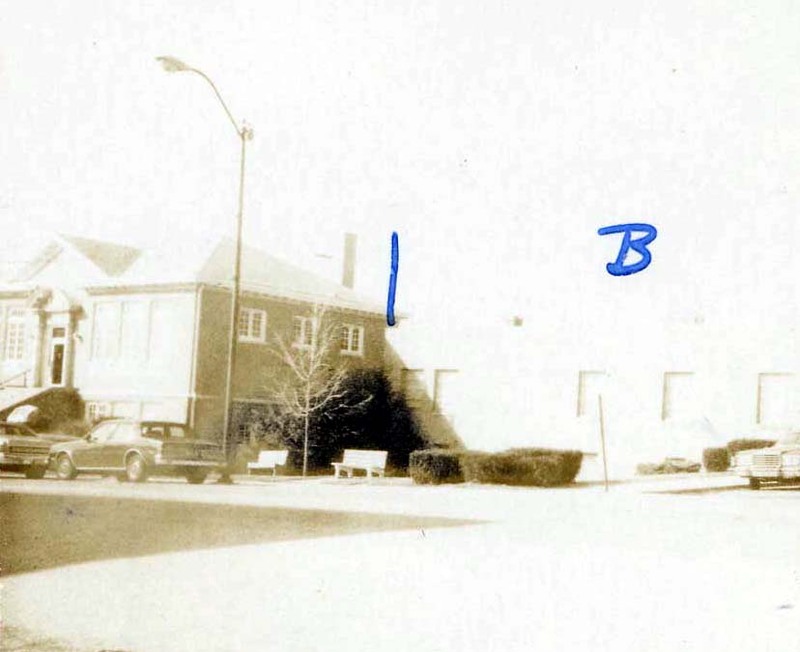 On the right, the Methodist Church, now gone, can be seen, the library just to the south of it, and the State Exchange Bank to the south of the library. 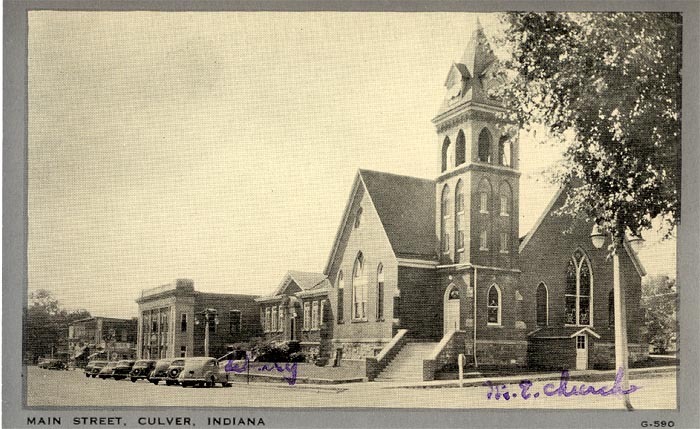 1939 postcard showcasing the United Methodist Church on Main St., seen from the northeast (the library is due south of the church, and the State Exchange Bank due south of the library). 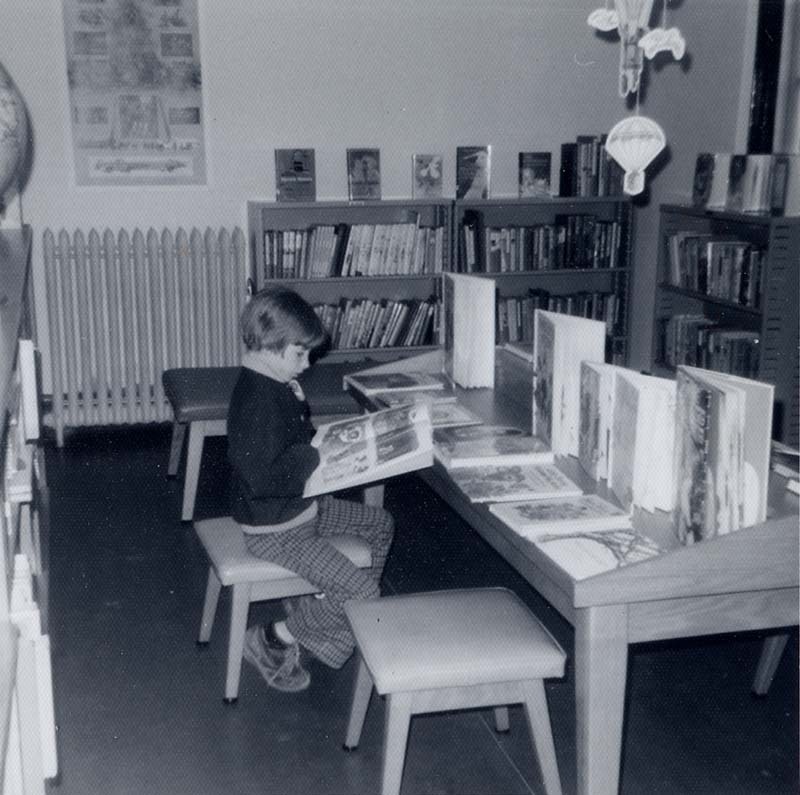 This and following photos show the interior of the Carnegie library, circa 1963. 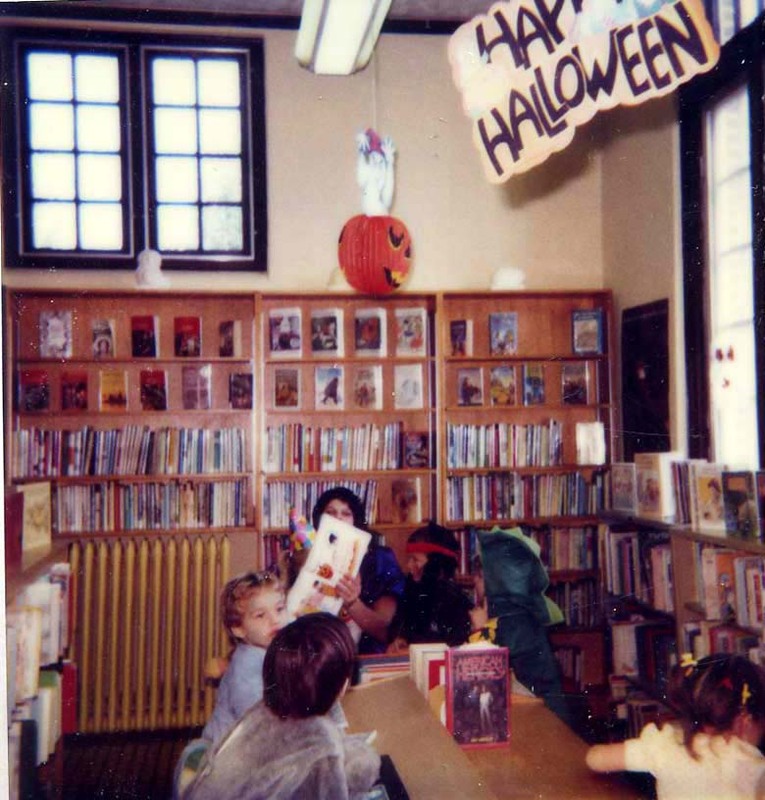 Pictured here is the upper level adult area. 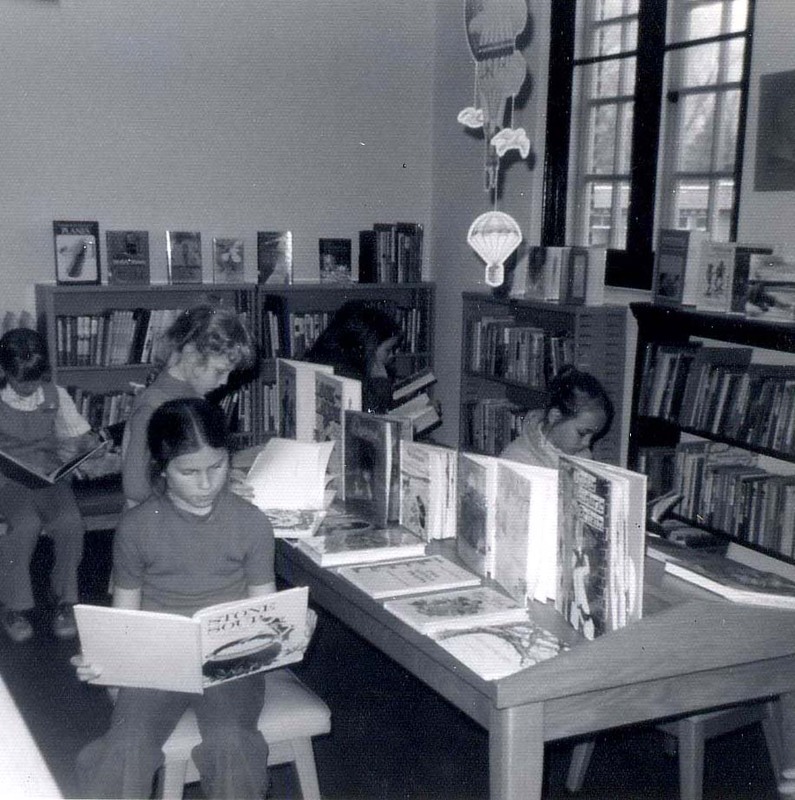 Several early 1960s shots of the upper level Carnegie, showing the children's area. 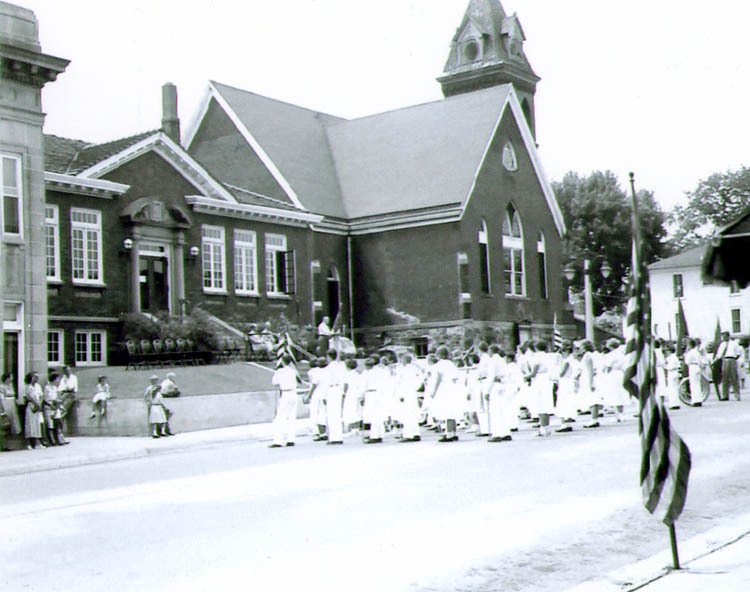 Above: photos pertaining to the 1950 dedication of the memorial stones in front of the library. 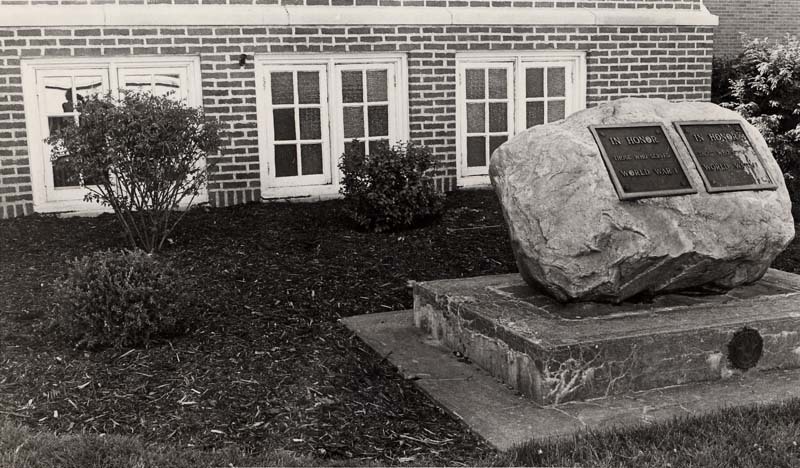 Diana Williams recalls being a young child at the dedication of the stones, and recalls there being a time capsule in the base of the stone. 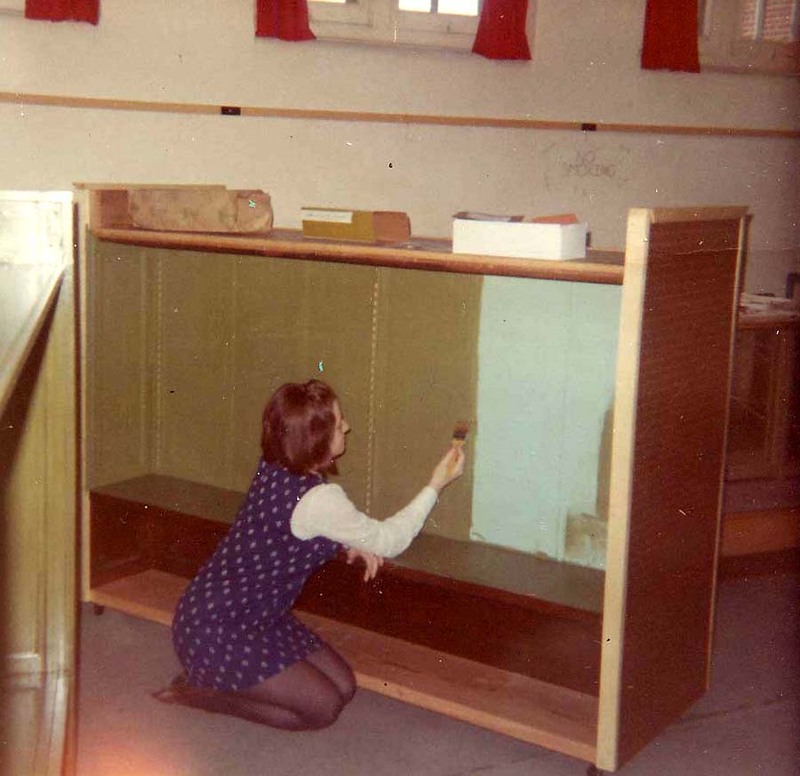 Perhaps a reader out there will know what became of the base (it may have been moved in the 2001 library renovation project) and the capsule. 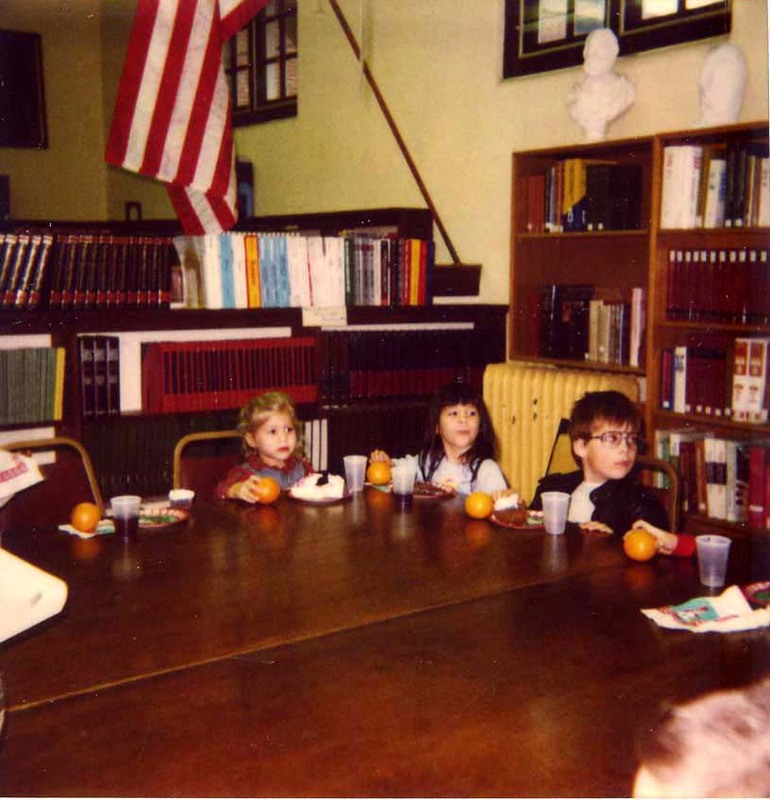 Above, from left: four photos of someone (anyone know who?) 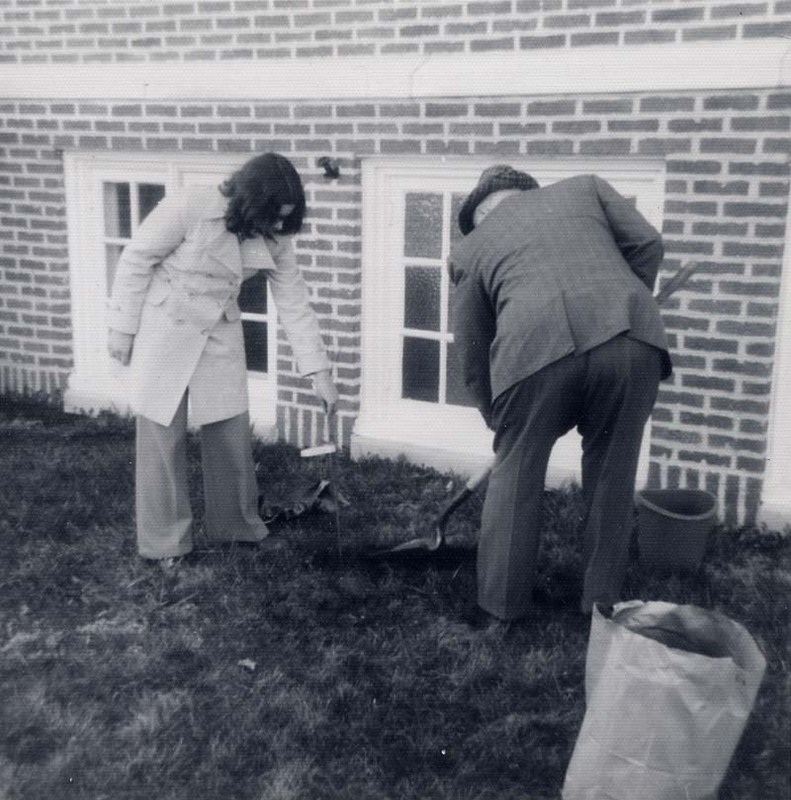 planting the shrubs that provided a backdrop for the stone; lower row, from left: he finished stone, with shrubs behind, and (at right) the dedication service for the memorial stone and flagpole, a photo taken by the late William Taber and loaned the library by his wife, Edna. 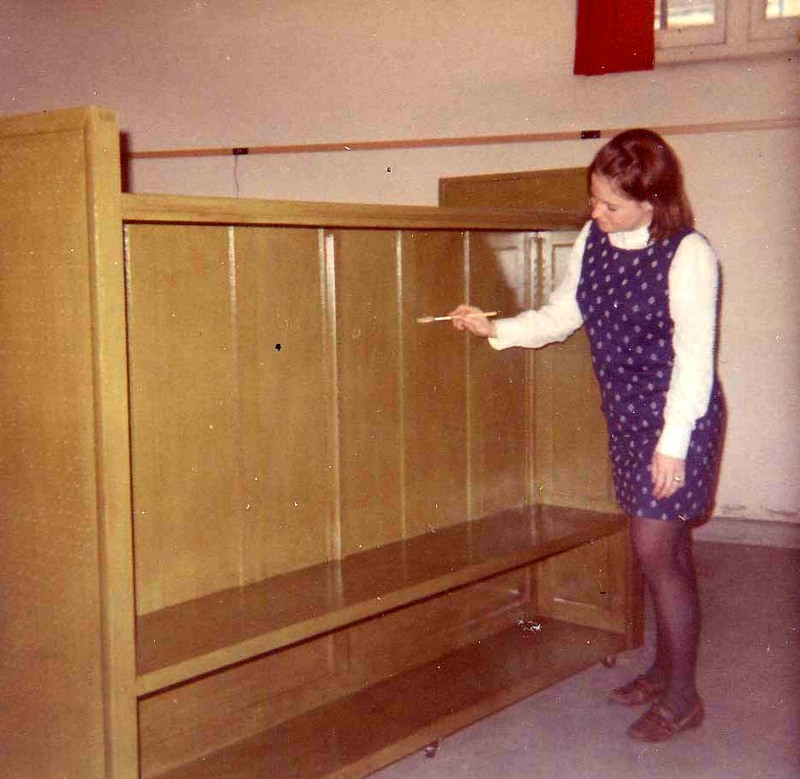 Also from 1963, working on a shelving unit in the original Carnegie library, probably lower level. 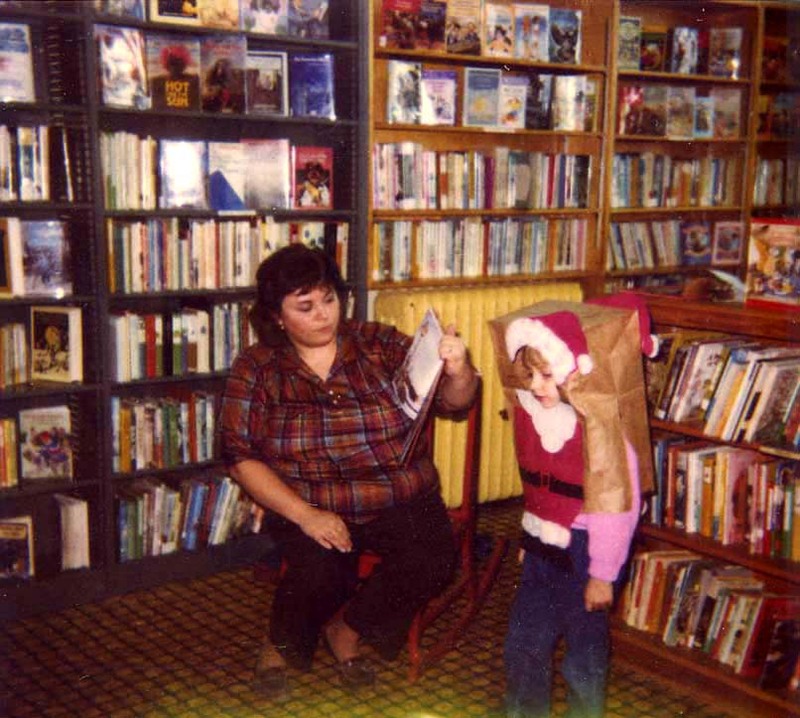 Can anyone identify the woman in these photos, apparently a library staff person? 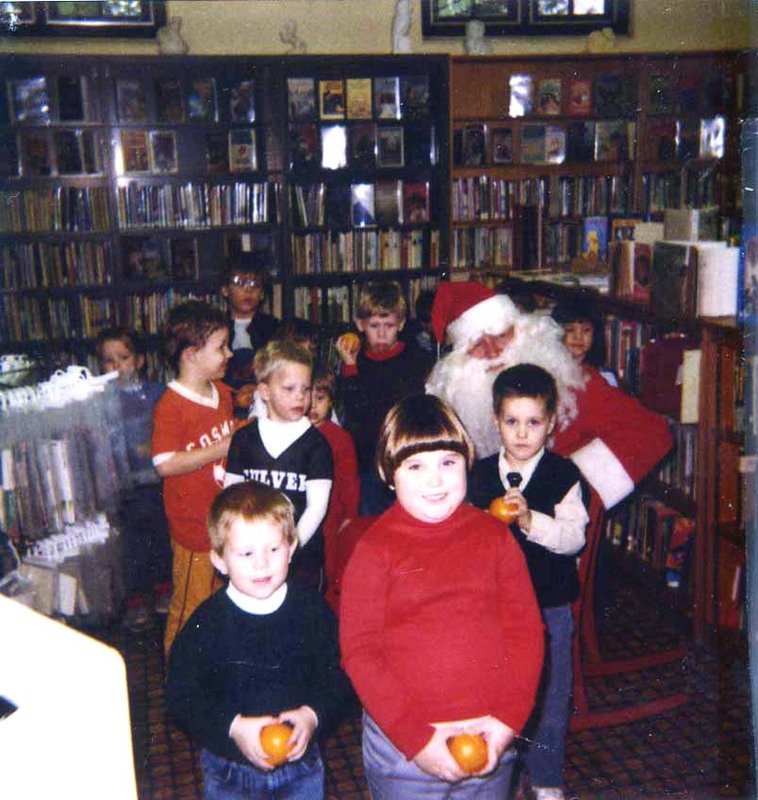 The Culver Public Library is seen at left in this early 1970s photo of the west side of North main Street in downtown Culver. 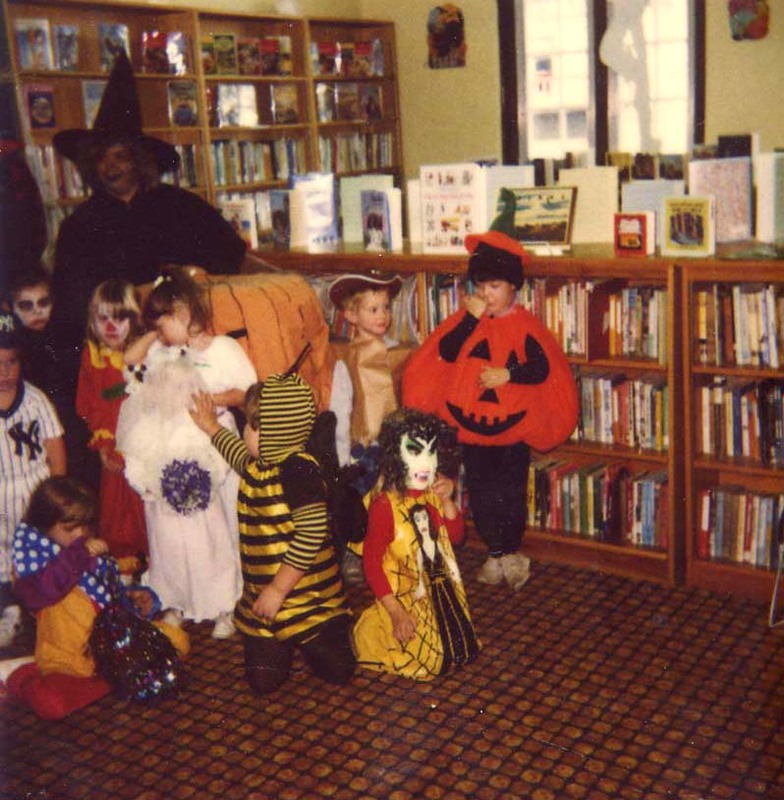 At right is the building that would house Norcen Insurance, demolished in the early 2000s to make way for the library's new addition. 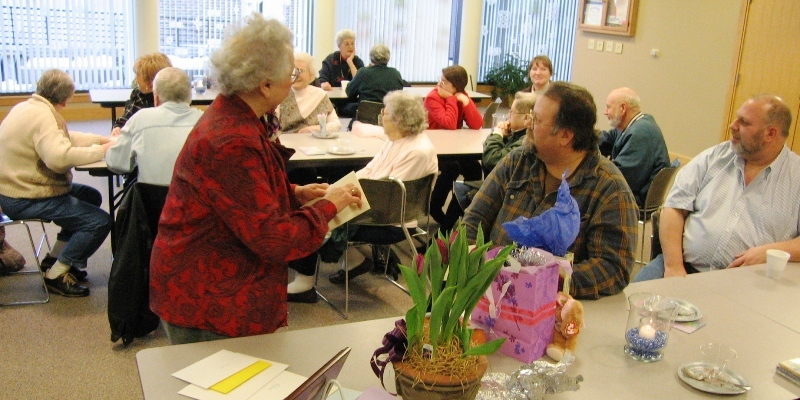 On January 27, 2007, the library threw a party to celebrate the contributions of Edna Taber, who began her work at the library in 1974, having served for nearly 35 years before her retirement in January of 2007. 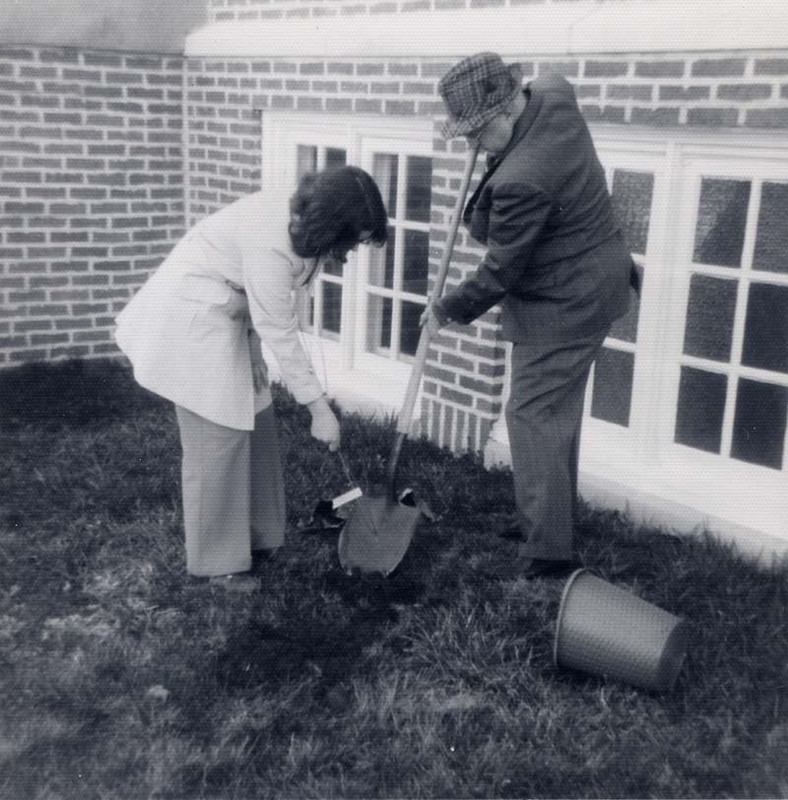 Mrs. Taber, who moved to Culver when she married Culver Academy graduate, the late William Taber -- who was also well known for his photography work around Culver and won statewide and regional prizes for his photographs -- began working at the library in 1974 as a circulation desk clerk, having worked in several other areas of the Culver community, including assisting her husband in the operation of the news stand on Main Street that they owned. 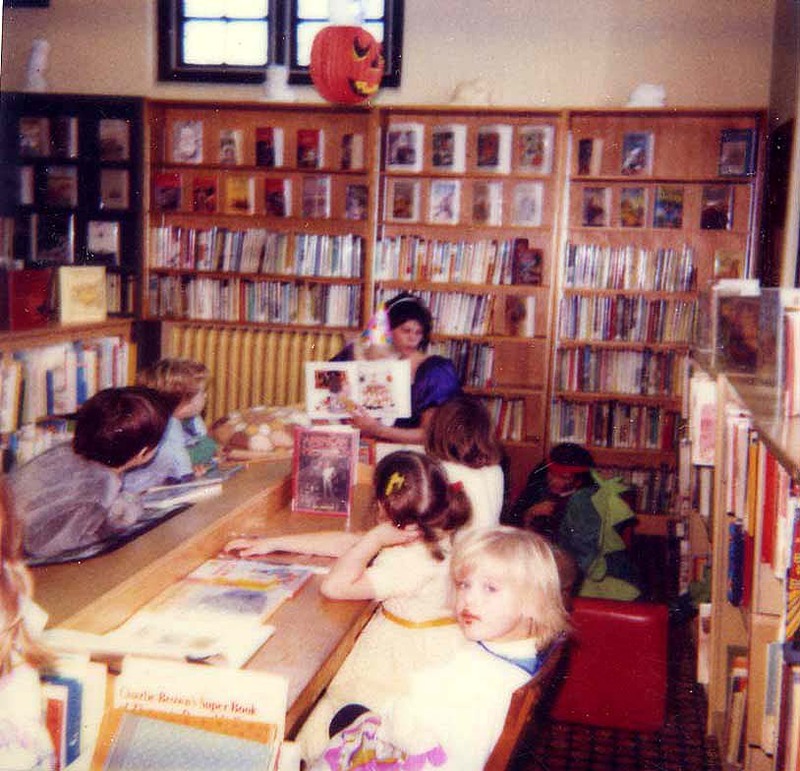 Over the years, her face and voice have become a seemingly inextricable part of the landscape of the library. 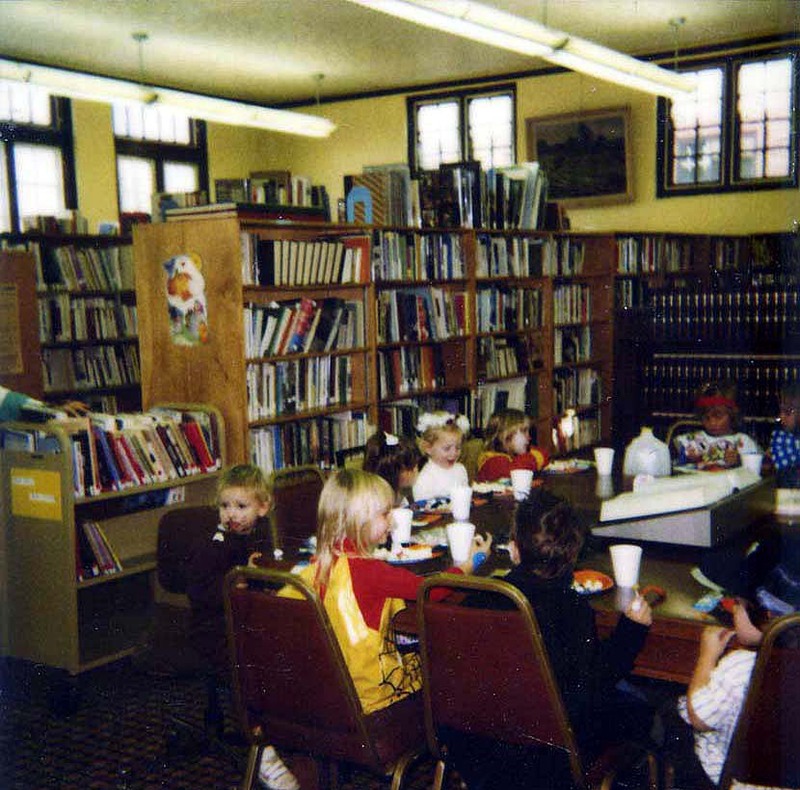 Many in the Culver community have grown up having Mrs. Taber check out their books for them, and many have heard her voice on the other end of the telephone when they neglected to return a book or other item to the library. 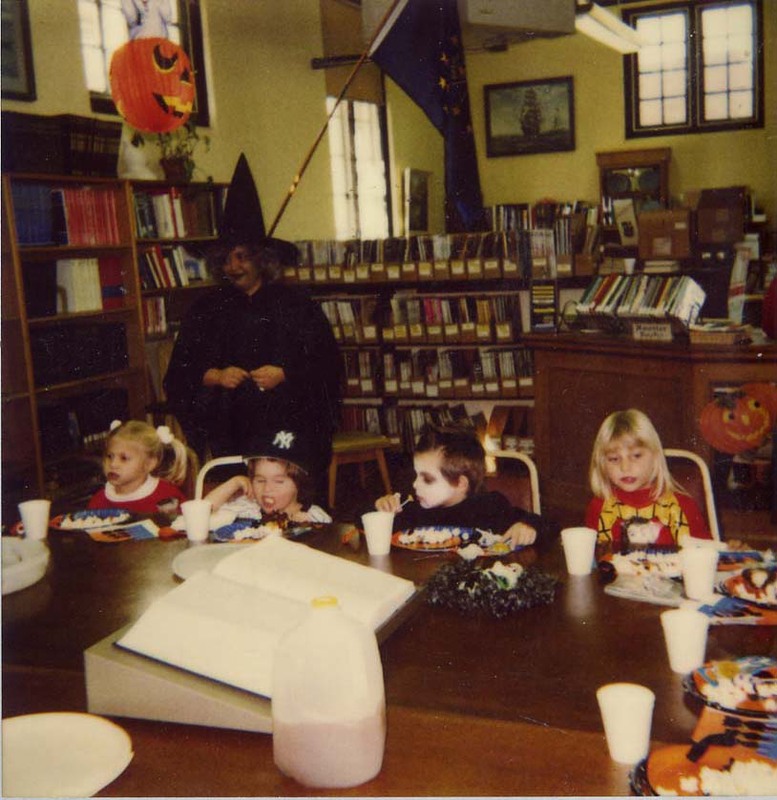 She has had a number of roles at the library in addition, including the creation of the library's extensive necrology file, a work she started years ago when she began indexing the obituaries from local newspapers into an alphabetical file. 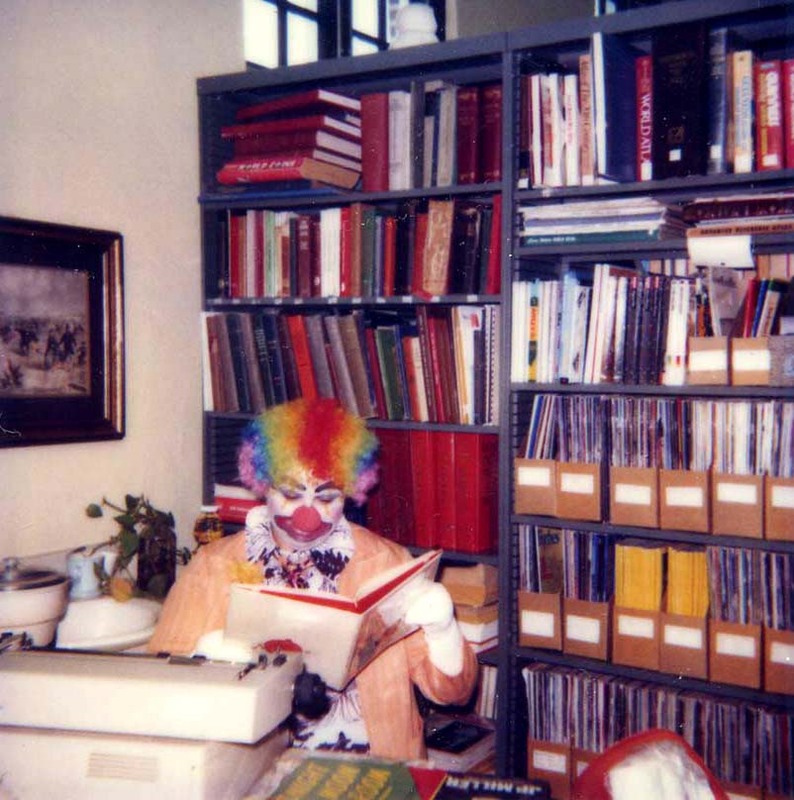 That file now contains thousands of records invaluable to those seeking local genealogical and historical information. 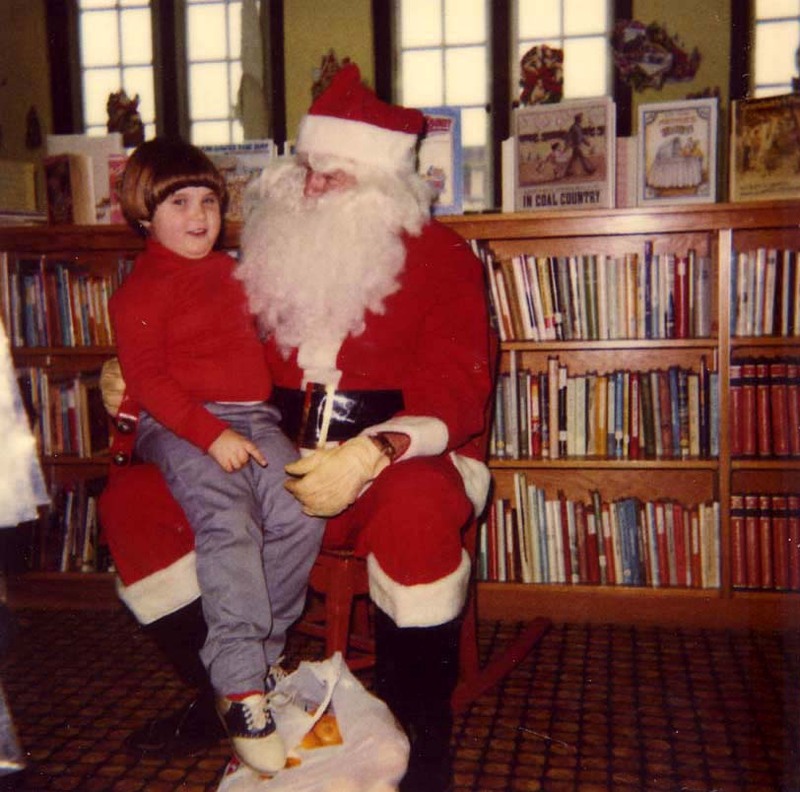 Photos Below, left to right: 1. 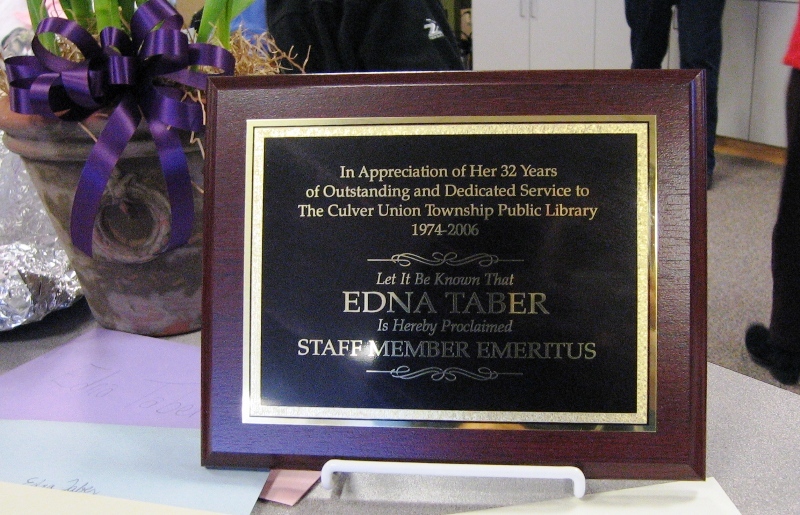 The plaque given Mrs. Taber honoring her as "Staff Member Emeritus;" 2. 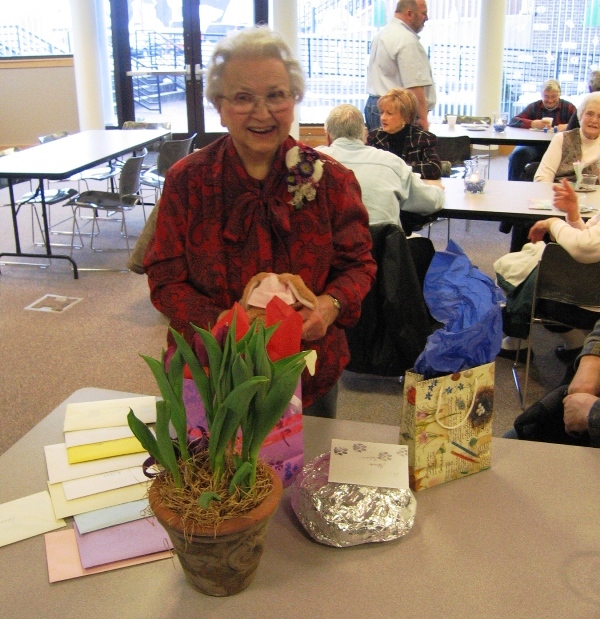 Mrs. Taber flanked by some of her gifts and cards; 3. 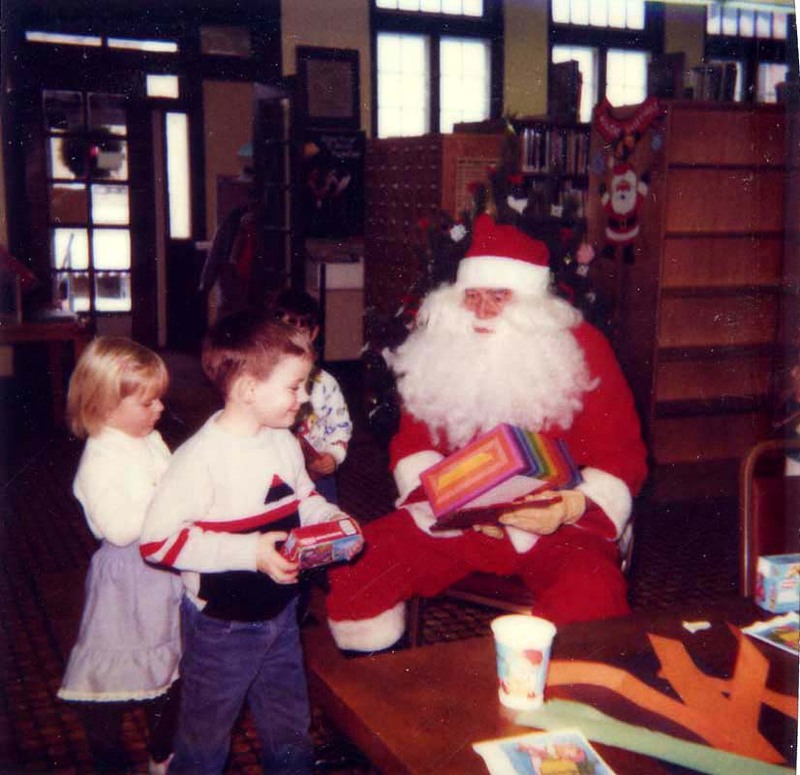 Holding the plaque and gift she received from the library; 4. 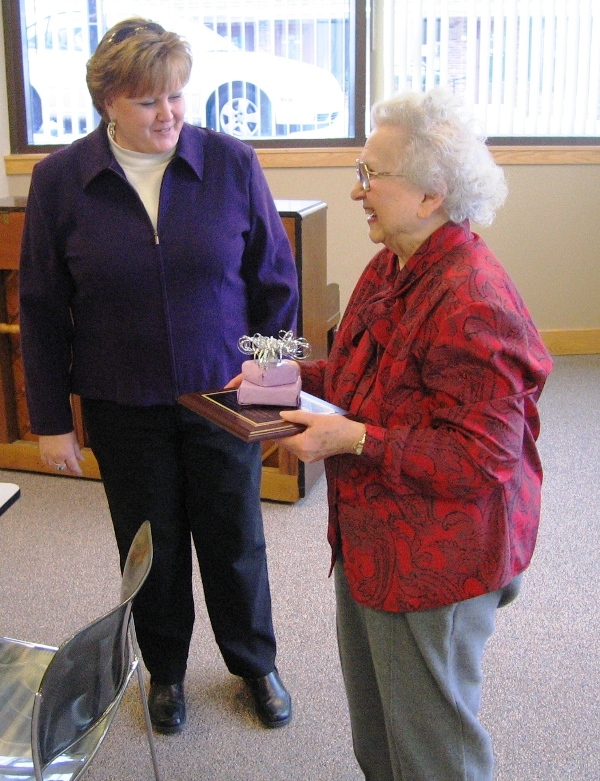 Being awarded the plaque by library director Carol Jackson; 5. 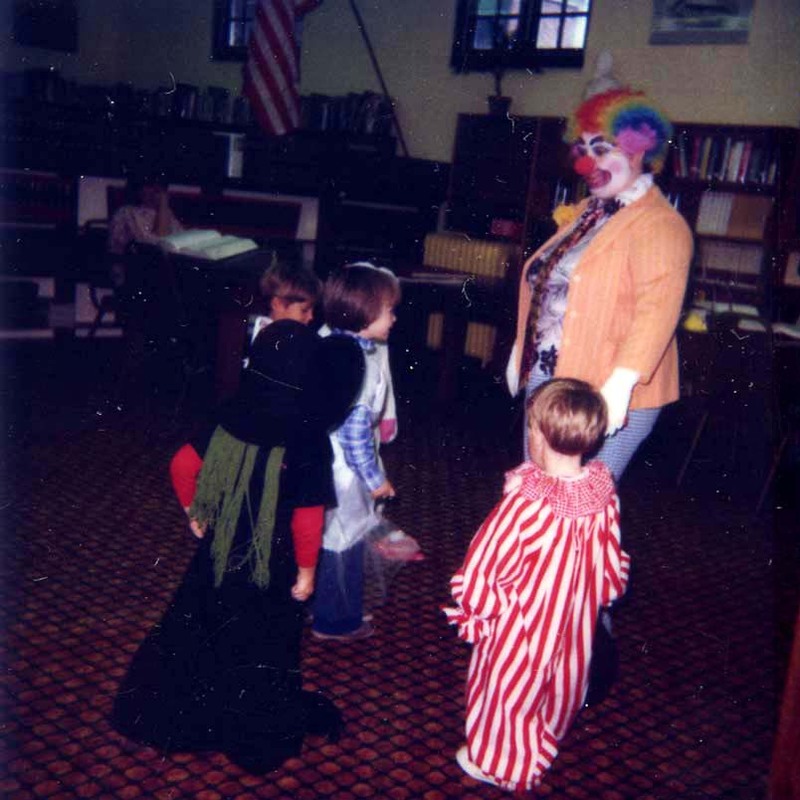 Mrs. Taber flanked by some of the well-wishers who attended the party. 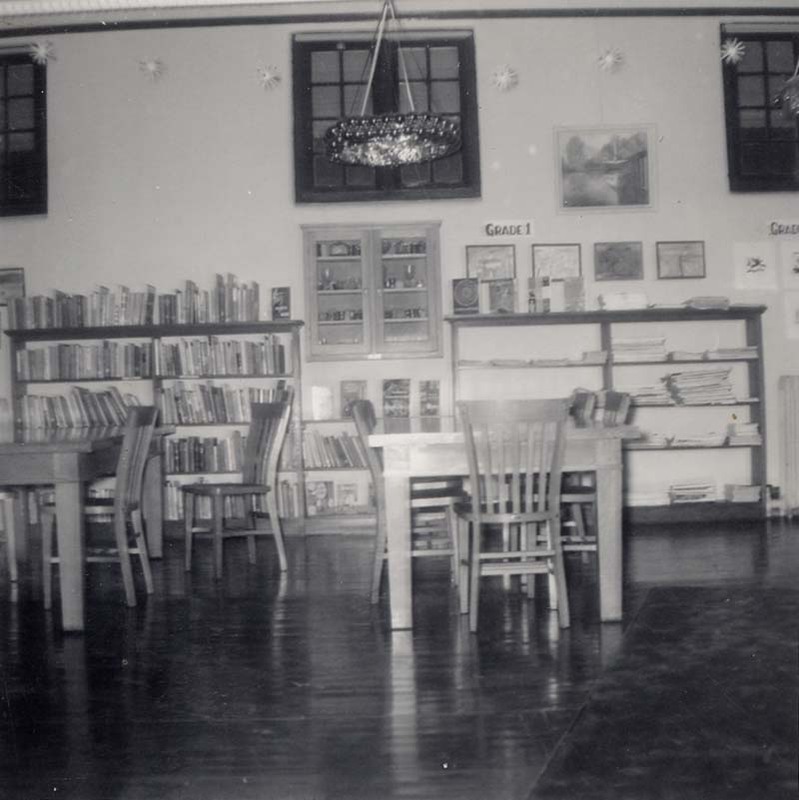 The interior of the original, 1915 Carnegie library changed very little over the years...certainly it remained virtually unchanged for at least 3-4 decades before its 2001 renovation. 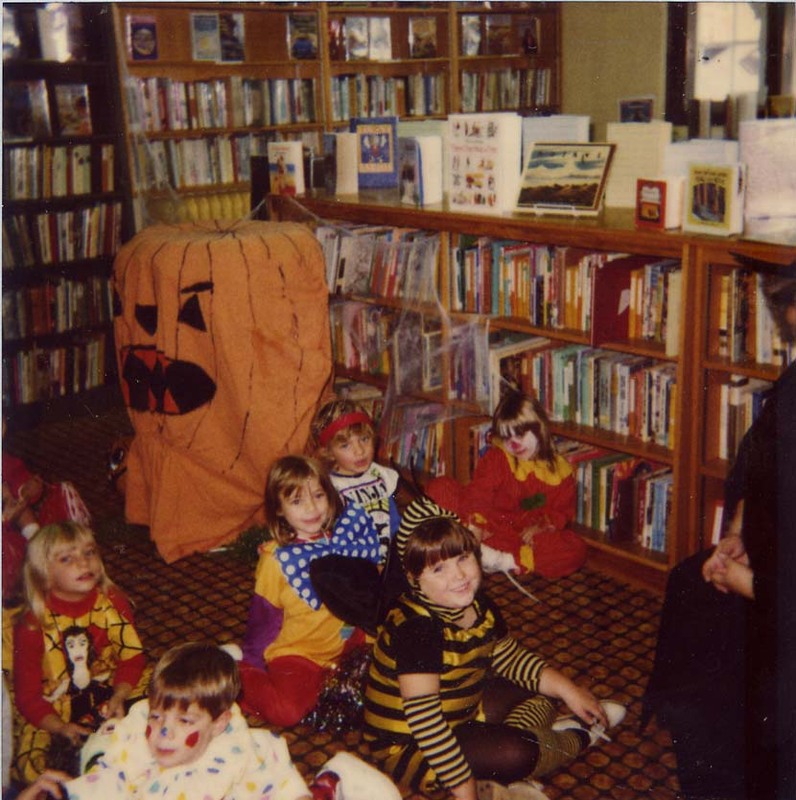 The photos below, besides showcasing faces and events of the library's past, chronicle the layout of the library as it existed for decades. 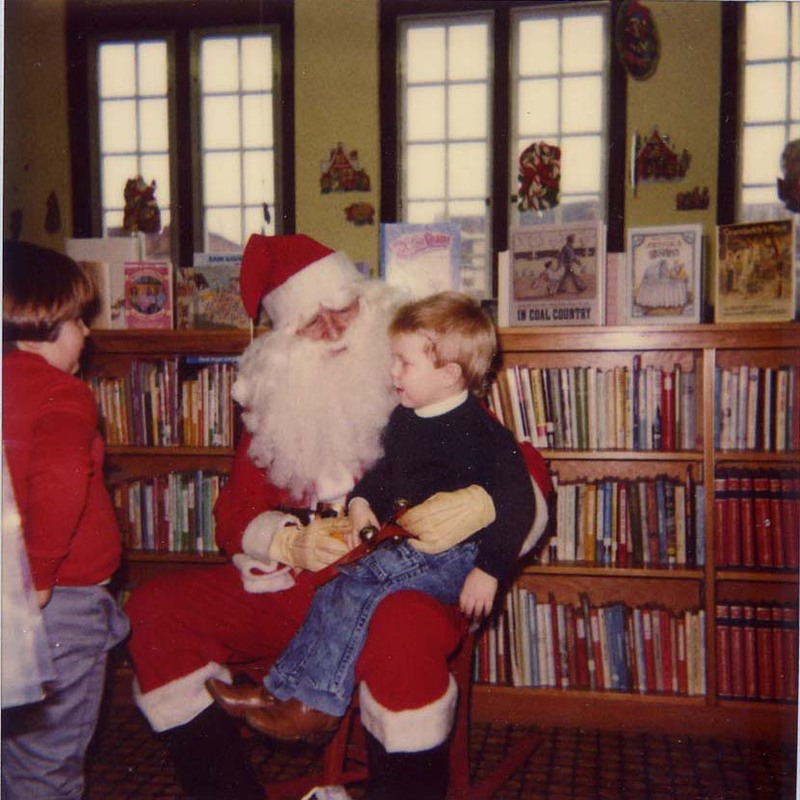 Although they were taken in the 1980s, these photos will likely harken back to many childhood memories of those who visited the library, even back into the 1960s and 70s, and before. 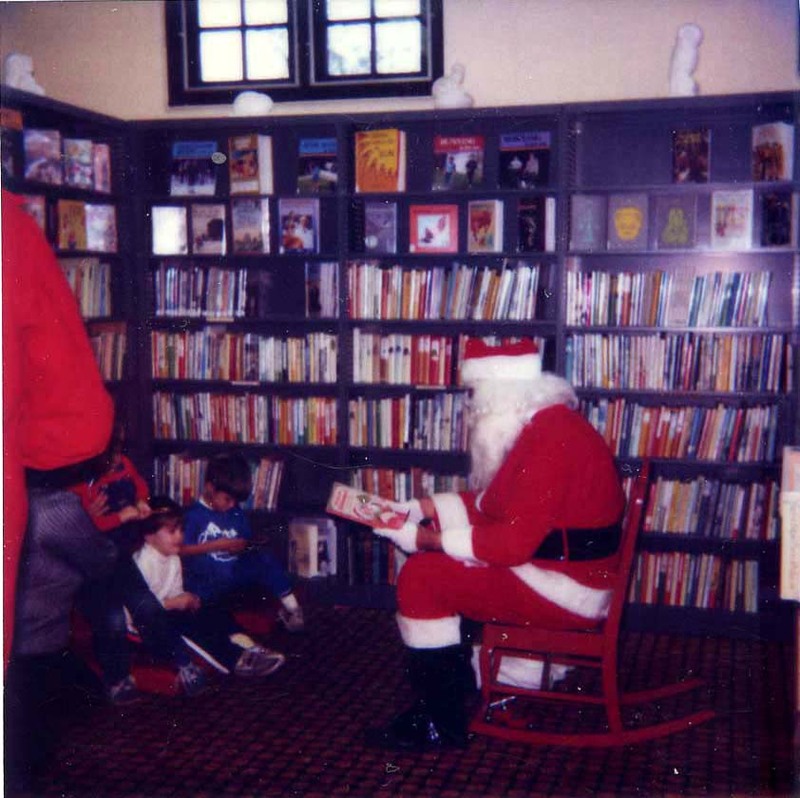 Above: numerous shots, from the 1980s, of various Christmas parties and Santa Claus visits at the library. 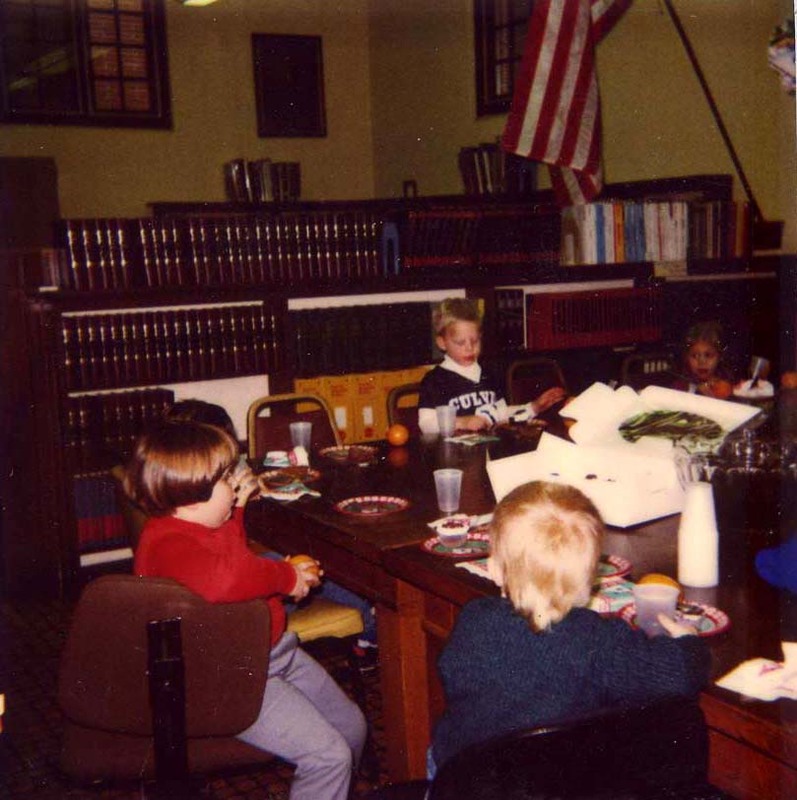 The top two rows of pictures were probably taken in the mid 1980s. 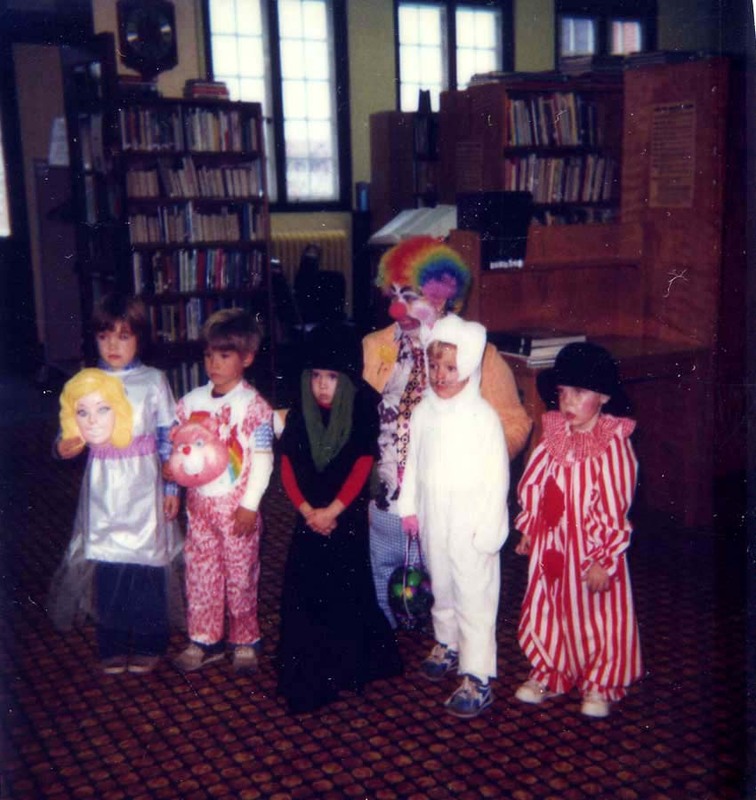 The third row probably date to the late 80s. 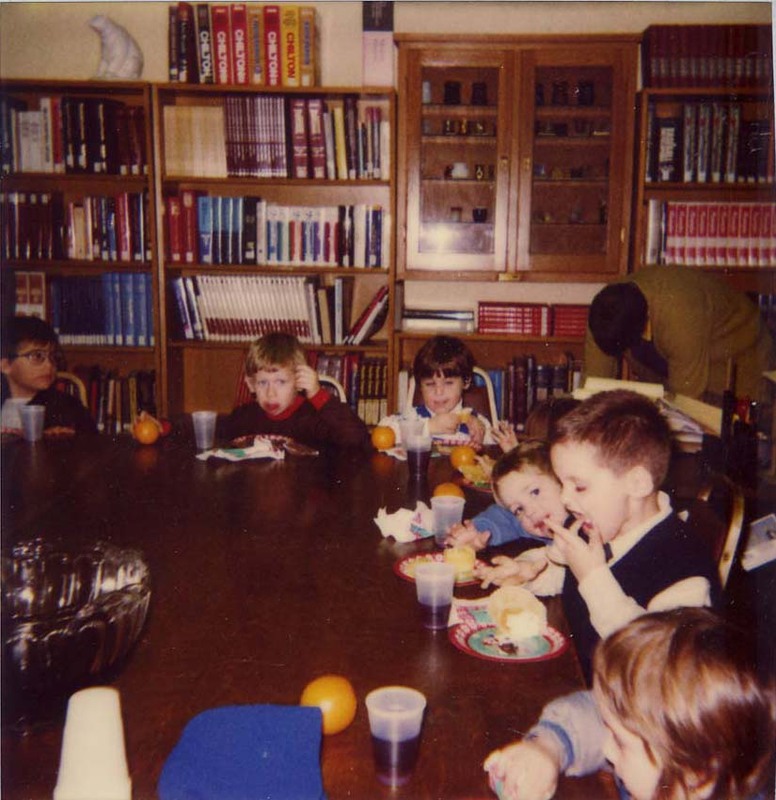 The lone photo in the fourth row was marked 1988. 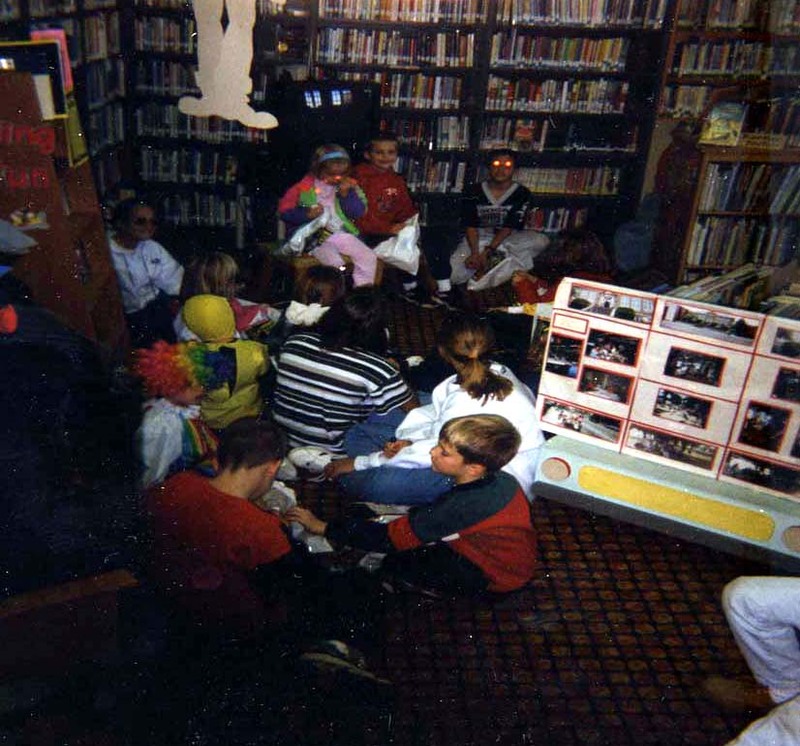 Above: a mid-1980s storytime in the children's area of the library. 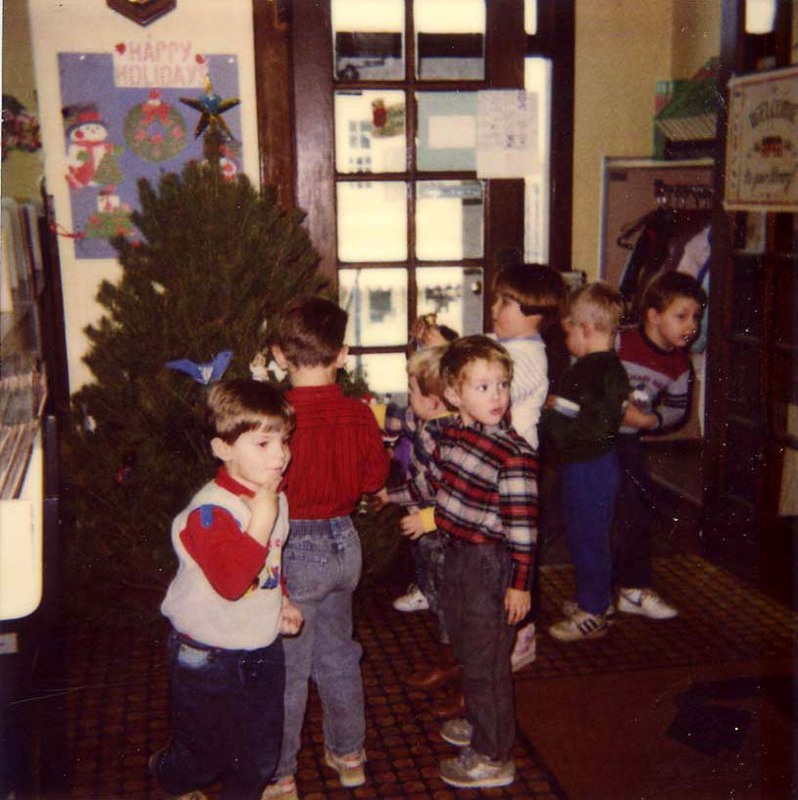 Past visitors will recall that the children's area was located in the northeast corner of the building, just to the right of the upper level door upon entering. 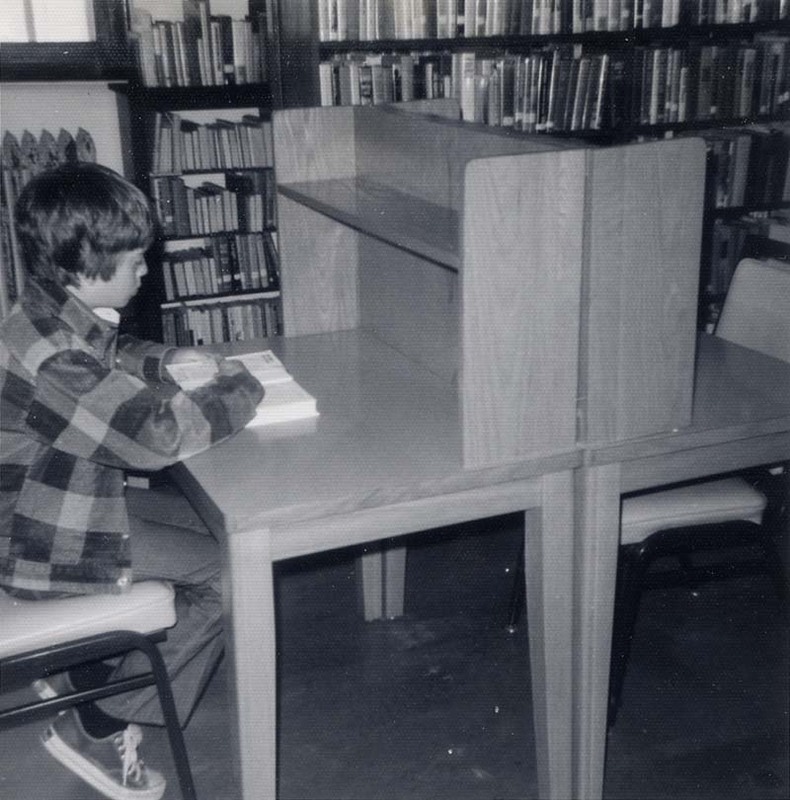 The circulation desk was in the southwest section of the same level, with the adult nonfiction books and some table space for meetings located in the southern section of the upper level. 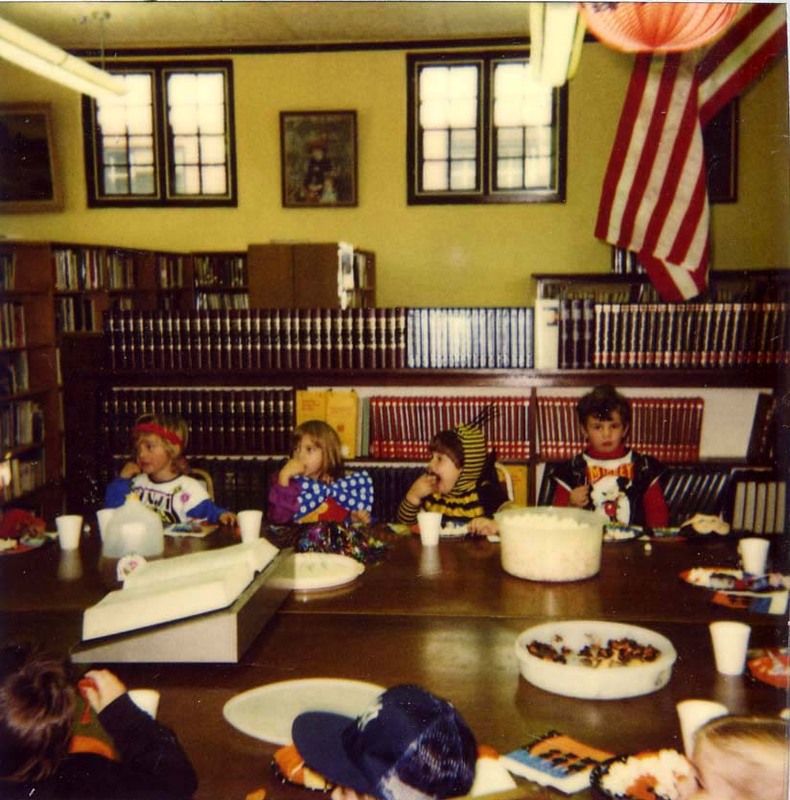 Above: Halloween parties of the 1980s at the library. 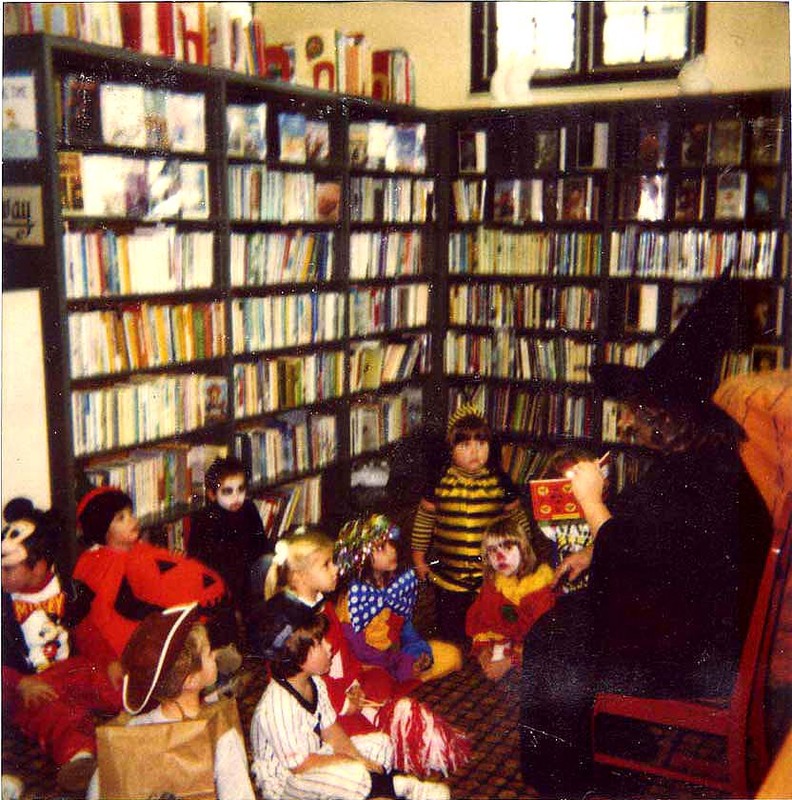 The top three rows show various Halloween-related functions from the mid-1980s. 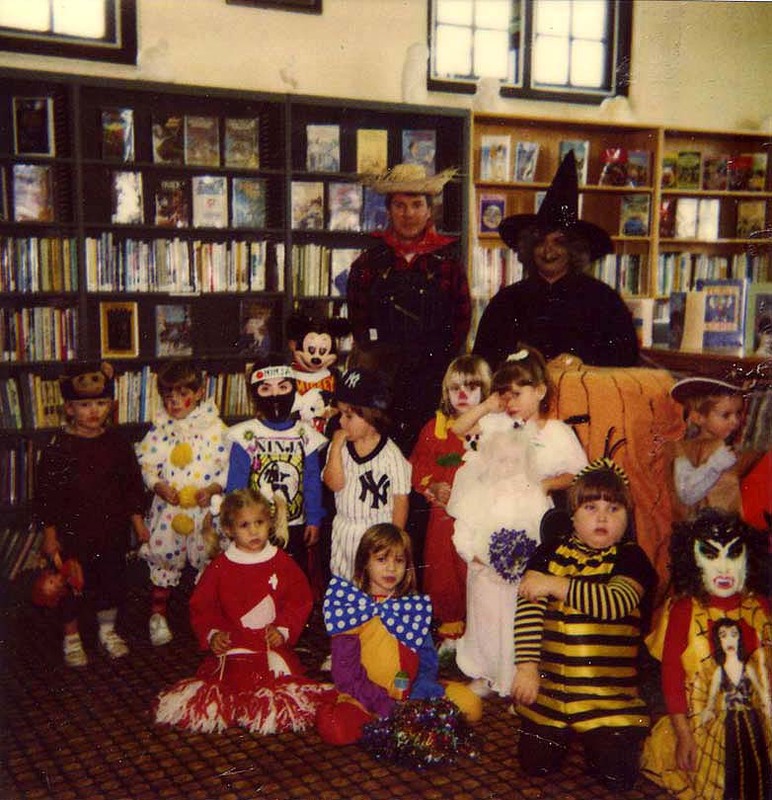 The bottom row shows (at far left) a photo that includes then-library director Fred Harper (in farmer costume). 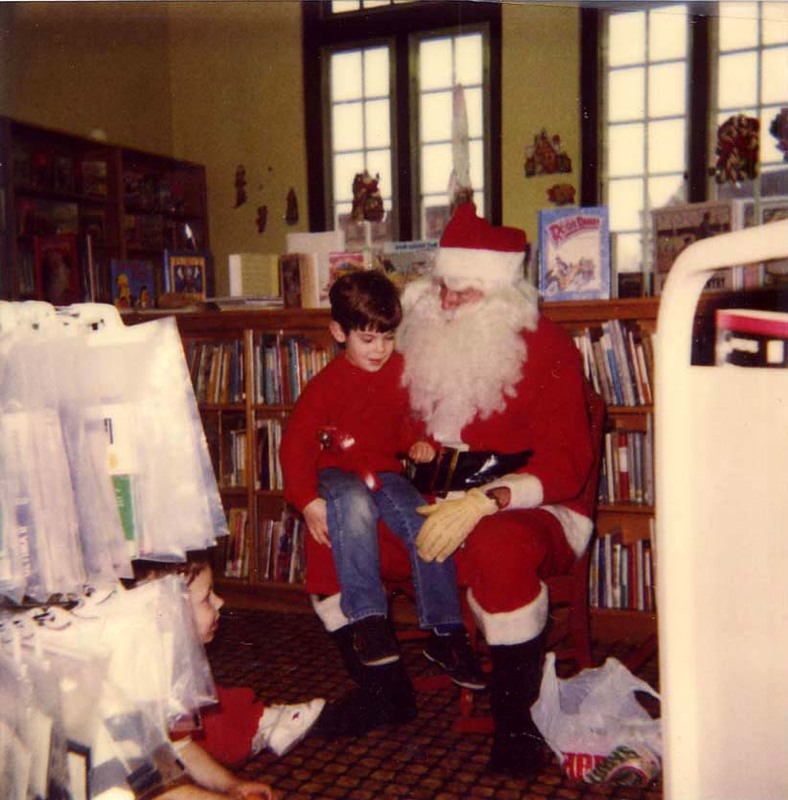 The three photos to the right were taken in 1987. 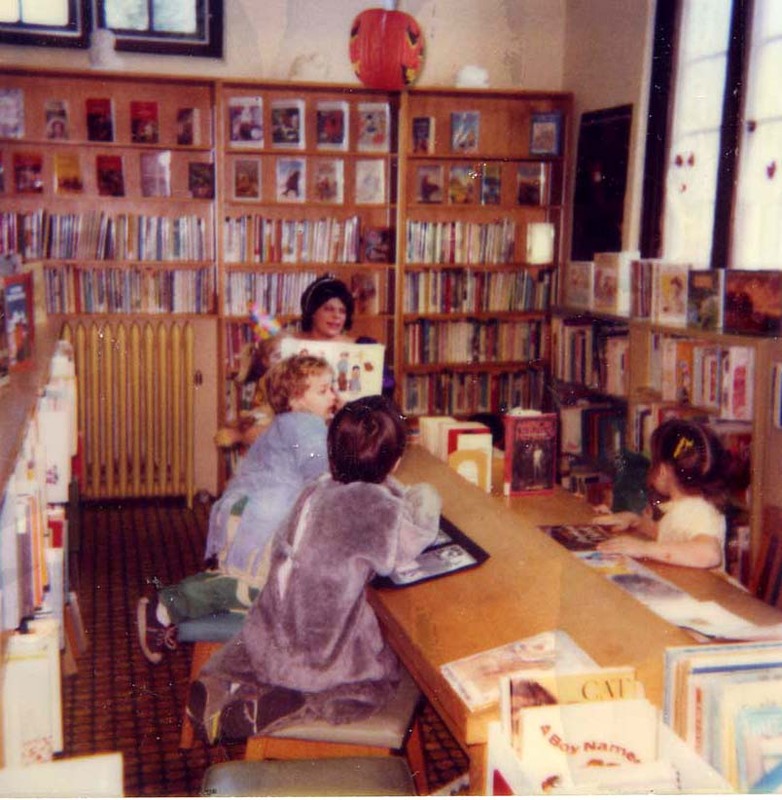 Two exterior shots of the library, taken in the 1980s. 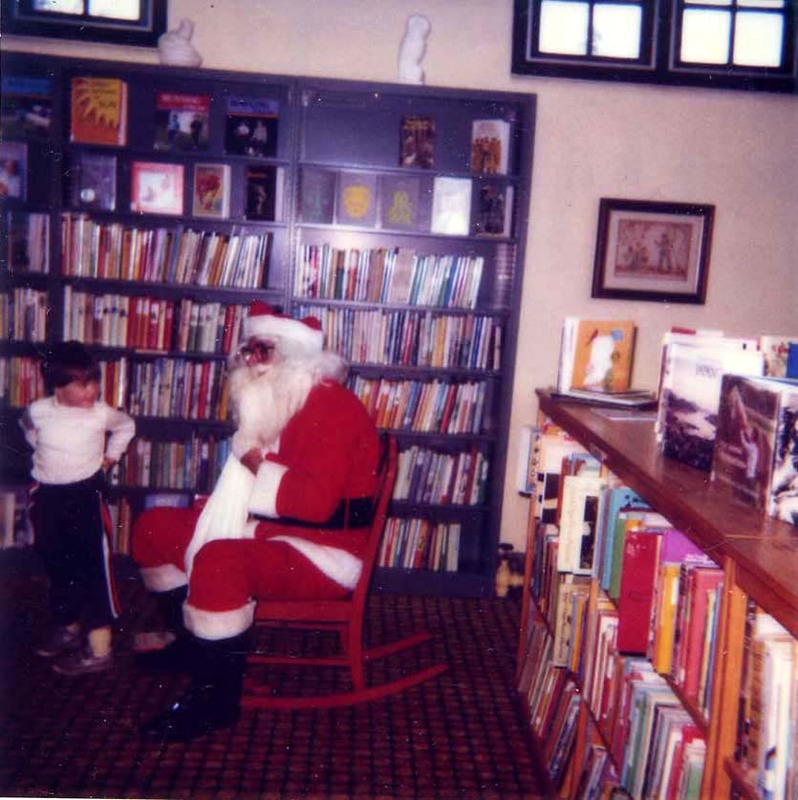 At left, a night photo taken in the wintertime by an unnamed photographer. 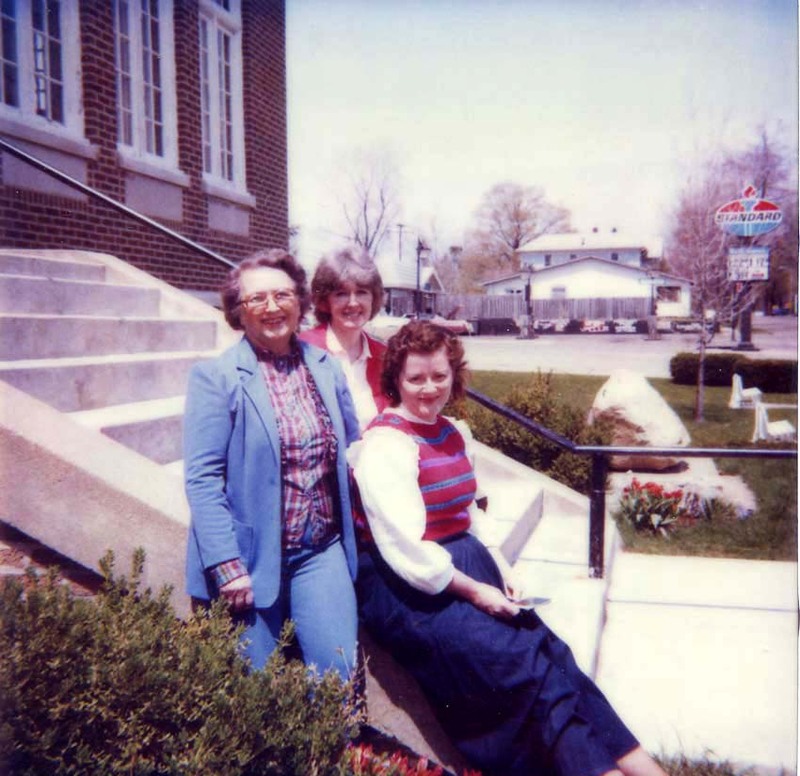 At right, Edna Taber (who retired from the library in 2007 at age 86), left, and Mary Jane Guise (then library director) at right, flanked in the middle by an unidentified staff member on the front steps of the library in 1984. Visible in the background is the service/gas station that was then still a Standard/Amoco station. 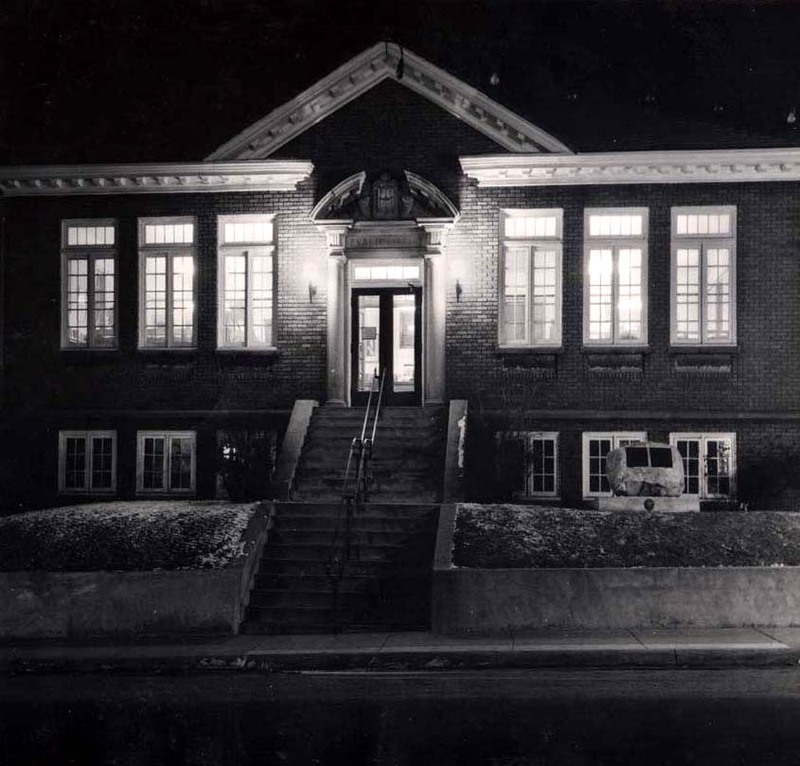 Most Carnegie libraries were designed to have community meeting space in the lower level and books only on the upper. 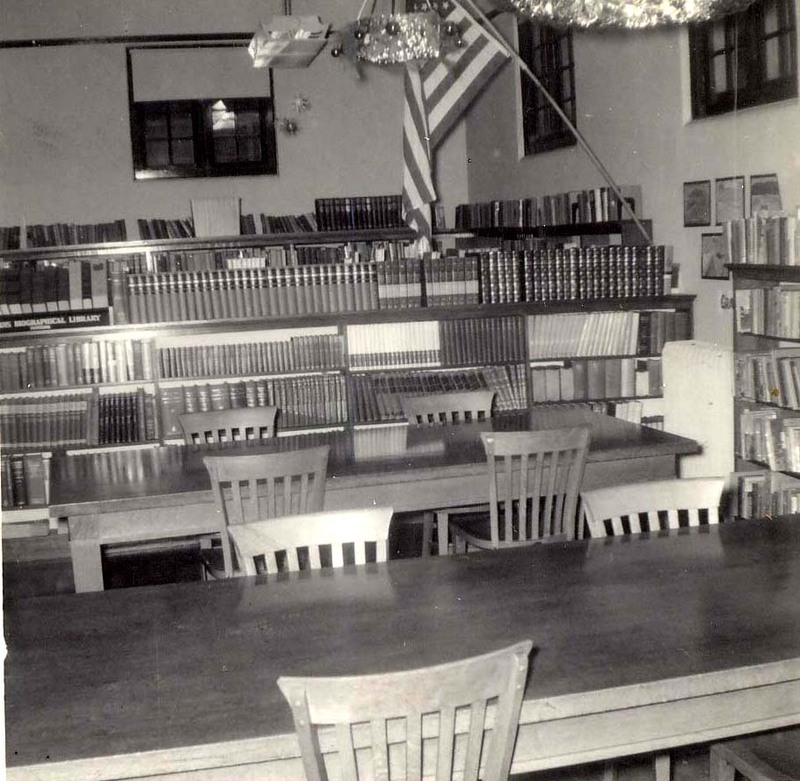 Culver's library was no different, and through at least the 1950s, the lower level remained a meeting and performance space. The stage at the north end of the lower level was used for recitals, performances, speeches, concerts, and as the altar space for many Culver area churches, who met there either because they didn't yet have any building (as in the case of St. Mary of the Lake Catholic church and Trinity Lutheran church for many years) or were going through some period of change or transition in their existing buildings (such as the Evangelical church, etc.). 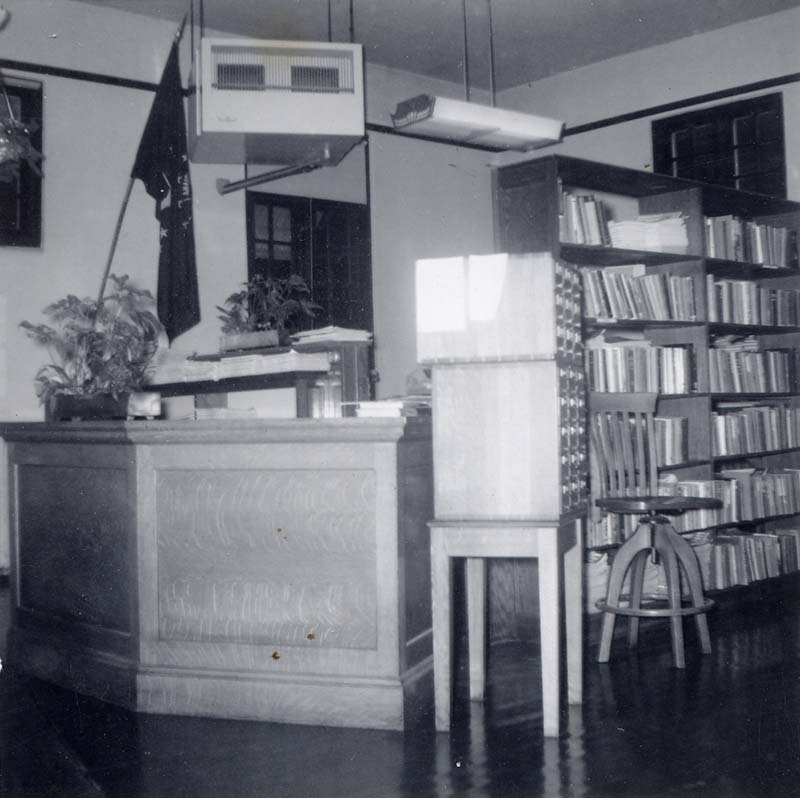 The lower level of Culver's Carnegie library featured a ticket window at the street entrance (south side of the building) and even a projection window above, facing the stage area (these can still be seen in that portion of the building today). 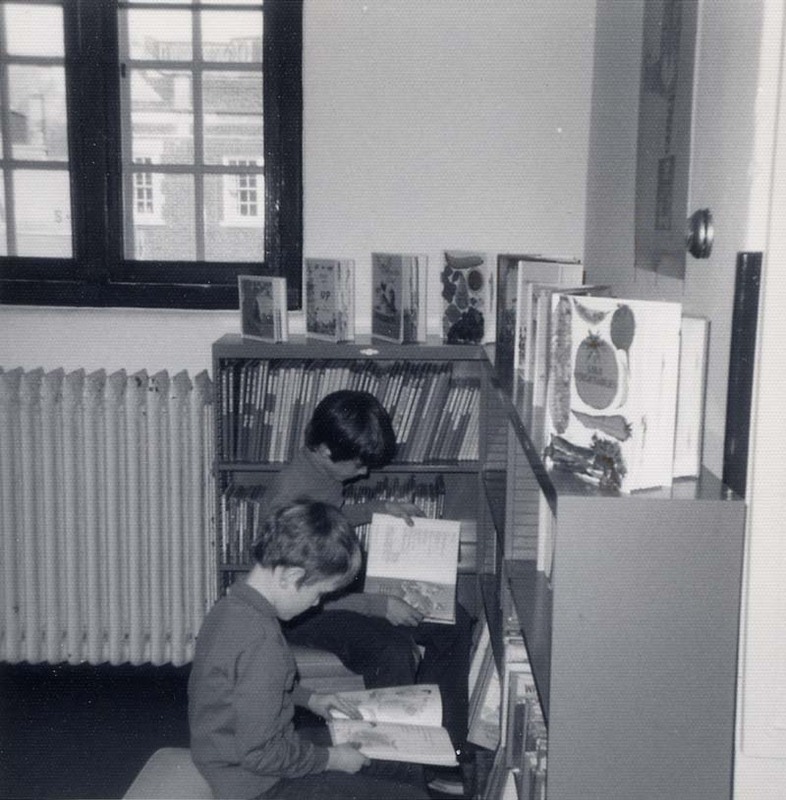 Sometime, probably in the 1960s, the lower level of the Carnegie library began to be used for the library's ever-expanding collection of books. 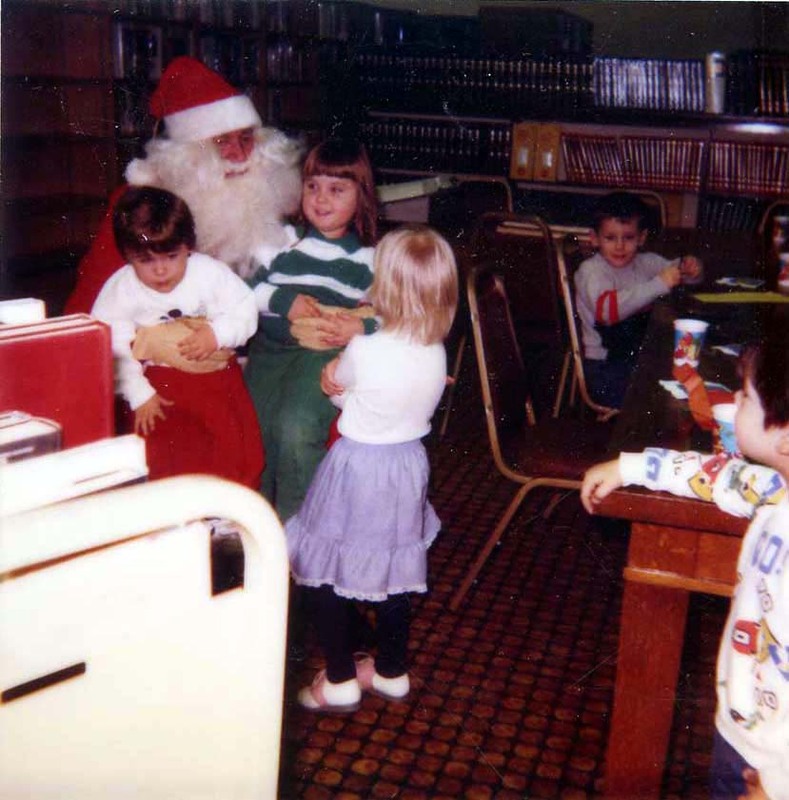 By the 1970s, the meeting space was mostly gone and the lower level housed the adult fiction, the library's large LP record collection, and the magazines and newspapers, besides having a second circulation desk. 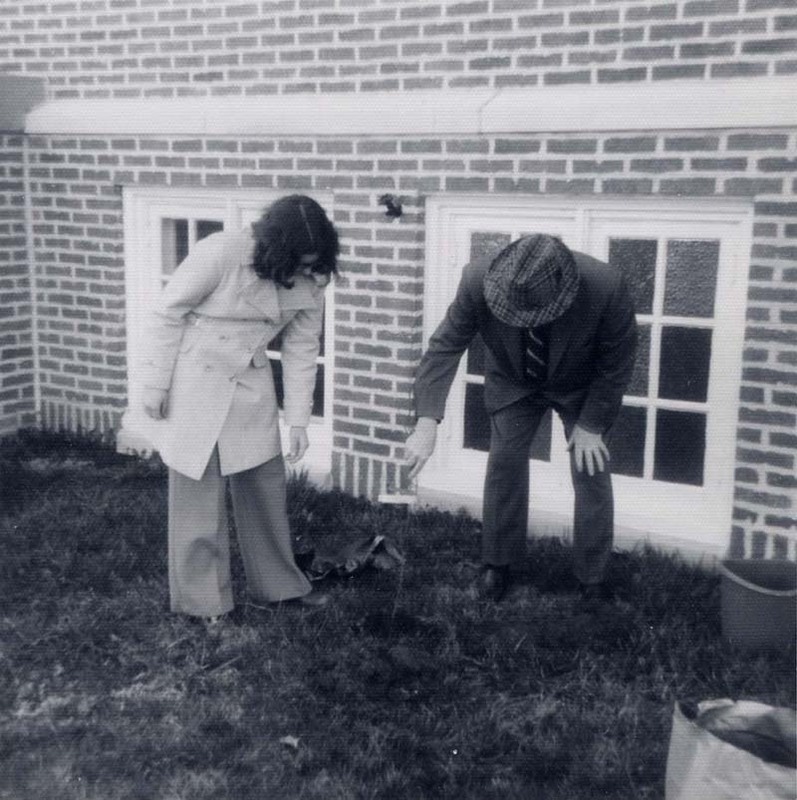 Click below to view the original land abstract for the land on which the library was built. 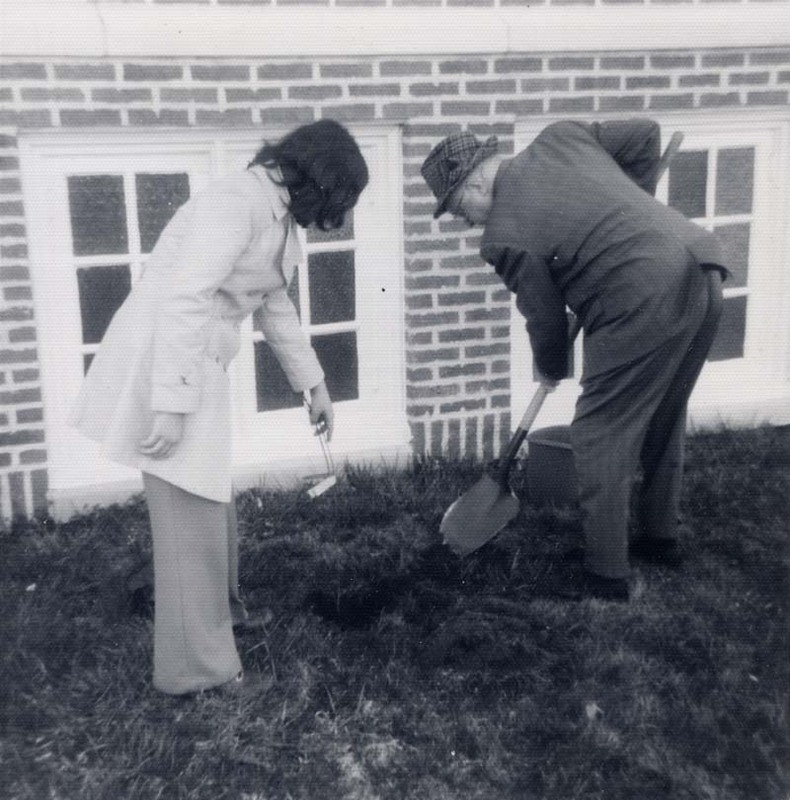 Dating well into the 19th century, the documents trace the history of the property up to its 1914 purchase for use in constructing the Carnegie library. 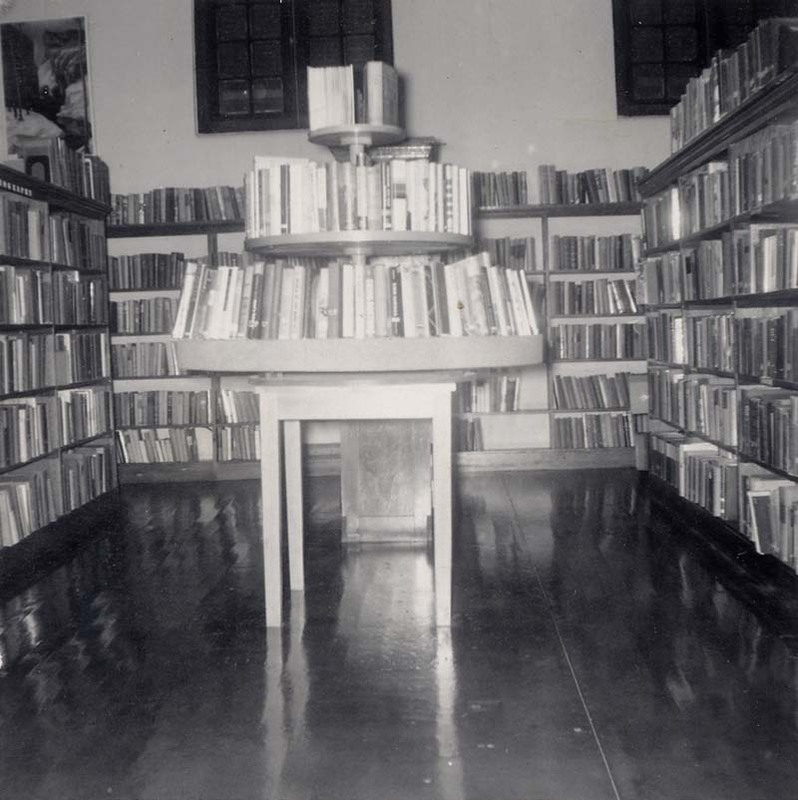 Also available for viewing are several of the original papers establishing the library and its collection, from 1914 and 1915.